A centrifugal pump converts input power to kinetic energy by accelerating liquid in a revolving device - an impeller. The most common is the volute pump - where fluid enters the pump through the eye of the impeller which rotates at high speed. The fluid accelerates radially outward from the pump chasing and a vacuum is created at the impellers eye that continuously draws more fluid into the pump. The energy from the pumps prime mover is transfered to kinetic energy according the Bernoulli Equation. The energy transferred to the liquid corresponds to the velocity at the edge or vane tip of the impeller. The faster the impeller revolves or the bigger the impeller is, the higher will the velocity of the liquid energy transferred to the liquid be. This is described by the Affinity Laws. If the discharge of a centrifugal pump is pointed straight up into the air the fluid will pumped to a certain height - or head - called the shut off head. This maximum head is mainly determined by the outside diameter of the pump's impeller and the speed of the rotating shaft. The head will change as the capacity of the pump is altered. The kinetic energy of a liquid coming out of an impeller is obstructed by creating a resistance in the flow. The first resistance is created by the pump casing which catches the liquid and slows it down. When the liquid slows down the kinetic energy is converted to pressure energy. A pump does not create pressure, it only creates flow. The gauge pressure is a measurement of the resistance to flow. 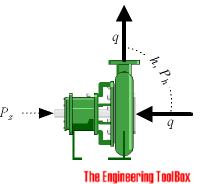 In fluids the term head is used to measure the kinetic energy which a pump creates. Head is a measurement of the height of the liquid column the pump could create from the kinetic energy the pump gives to the liquid. The pump's performance on any Newtonian fluid can always be described by using the term head. The head is measured in either feet or meters and can be converted to common units for pressure - like psi, Pa or bar. The only difference between the fluids is the amount of power it takes to get the shaft to the proper rpm. The higher the specific gravity of the fluid the more power is required. Centrifugal Pumps are "constant head machines"
Note that the latter is not a constant pressure machine, since pressure is a function of head and density. The head is constant, even if the density (and therefore pressure) changes. Pump efficiency, η (%) is a measure of the efficiency with which the pump transfers useful work to the fluid. Engineering ToolBox, (2003). Centrifugal Pumps. [online] Available at: https://www.engineeringtoolbox.com/centrifugal-pumps-d_54.html [Accessed Day Mo. Year].